Every year, millions of people resolve to get fit and healthy. It is by far the most popular end-of-year resolution. Well, the new year has arrived and it’s back to reality. Vacation is over and we’re back to our daily routines. It’s the third day of the year – so right about the time that New Year’s Resolutions go out the window. Last year this blog’s main focus was on the new normal of prematurity. This year is a fresh start and, since the muppets are big giant babies these days, I foresee a theme of the hilarity of early childhood. To aid this thematic transition, I would like to present you all with an opportunity to keep that popular resolution. The March of Dimes March for Babies is an event that raises money in support of programs that help moms have healthy, full-term pregnancies. And it funds research to find answers to the problems that threaten our babies (like being diagnosed as “tiny”). These walks have been taking place since 1970 and have raised an incredible $2 billion to date. Join me and the Classy Moms mothers group in this fight for health – yours five miles down the trail and all the little lives the March of Dimes will touch. Why is our fundraising goal $270? Seems like a random trivial amount considering it’s in honor of the million dollar miracle muppets doesn’t it? I designated this as our team goal as a symbol of our honorees – born at 27 weeks gestation. This isn’t a fundraising ploy – this is a request to come out and walk with us in a show of support for your favorite muppets and all their peers. March for Babies take place all over the nation – look for one near you if the Muppet March is geographically undesirable for you. 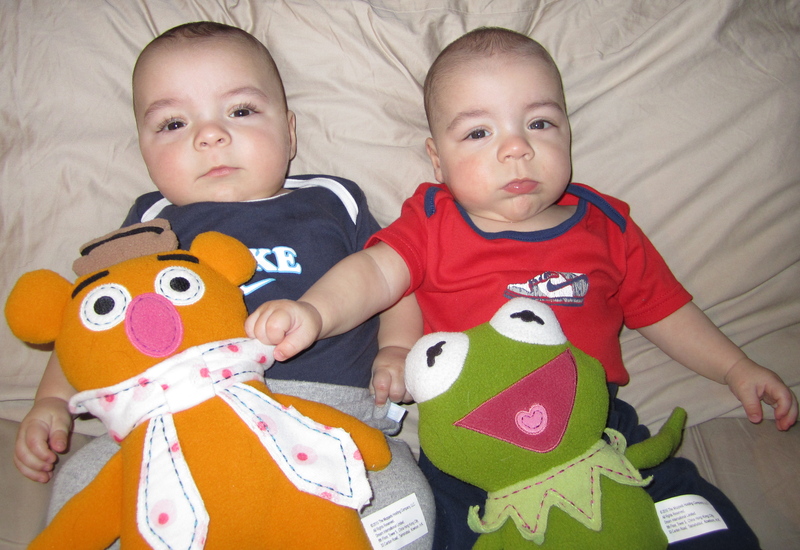 I am so immensely grateful for all the care the muppets received during their harrowing first few months; I wholeheartedly support anything that potentially eliminates the need for the 2010 preemie chapter of this blog. So get started on that fitness resolution. Start walking. You’ve got five miles in front of you. The muppets have so many more. What darling pictures!! they do look alike — Never thought Destroy would look so happy in the “Bumpo” chair — and those eyelashes!!! G.G.